The Federal government has launched a new website dedicated to stating the facts on the state of our wireless industry, in an attempt to convey a clear message to consumers currently being bombarded by the PR campaign by incumbents. Industry Minister James Moore announced the site from his Twitter account, known as “Canada.ca/MoreChoices”; it actually redirects to a section on the Industry Canada web page. This new wireless landing page is in addition to the website ConsumersFirst.ca, launched back when Minister Moore embarked on a cross-country speaking tour to reiterate the government’s message. Yesterday, the Conservative government sent out an email update to those who signed up at ConsumersFirst.ca, to note the “government will not back down” against Rogers, Telus and Bell. 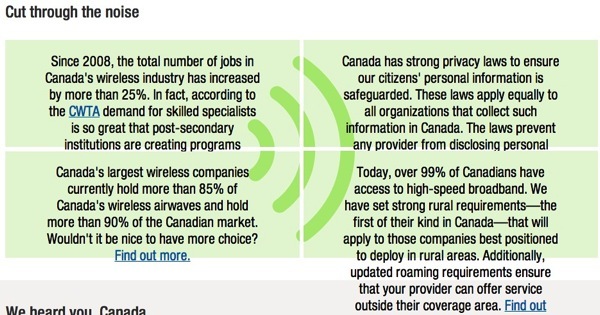 It appears Ottawa has ramped up its efforts to defend itself from incumbent PR attacks, which claim existing wireless spectrum rules are unfair and favour foreign companies like Verizon.